During the two weeks from 9 to 21 September, 15 of China’s next generation of government and business leaders from the All China Youth Federation (ACYF) attended an exchange programme designed and facilitated by GBCC. The ACYF is an adjunct to the Communist (Party) Youth League, which has 110 million members and is a key training ground for China’s future political leaders. GBCC and ACYF have worked together for several years on leadership activities to build understanding between young British and Chinese leaders. 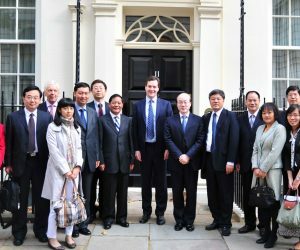 Plans to extend our cooperation to an education and exchange programme were initiated at the 2017 UK-China High Level People-to-People Dialogue. The programme provided an opportunity to familiarise participants with the UK’s key principles and outlook, as well as its governmental, business, civil society and educational institutions. The delegation comprised of the ACYF’s central and provincial leaders, rising civil servants, and business executives from private sector and state-owned companies, including the technology giant Tencent, and engineering consultancy and investment firms. It was led by Ciwang Pingcuo (pictured), the ACYF’s deputy secretary-general and director of the Youth League’s central general office. 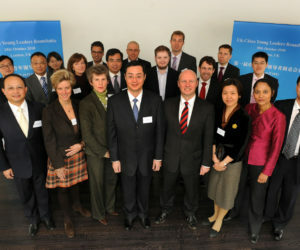 During their first week in London, the delegation met with UK politicians, policy-makers, and business and community leaders, and participated in the eighth UK-China Young Leaders Roundtable, in which UK participants were led by Andrew Gwynne MP, shadow Secretary of State for Communities and Local Government. The delegation’s London engagements included briefings from the Foreign and Commonwealth Office on UK-China relations (pictured); a roundtable on UK-China trade opportunities at the China Britain Business Council; discussions on youth policy and engagement from the UK government’s Office for Civil Society and leading young people’s organisation UK Youth; and a presentation from the Institute for Government on the UK’s political and institutional landscape. In their second week, the delegation stayed at the University of Oxford’s St John’s College. The programme included intensive sessions with some of the UK’s foremost academics and creative thinkers, as well as engagement with young UK politicians at the local grassroots level. A roundtable at the Oxford China Centre with Professor Rana Mitter and his colleagues discussed contemporary China, and presentations from Professor Ian Goldin (pictured) and Dr Carl Frey of the University’s Martin School addressed the impact of emerging technologies on societies and economies. Ewan Smith from the Oxford Faculty of Law and the Blavatnik School of Government’s Associate Professor Emily Jones delivered lectures on the UK’s constitutional landscape and Brexit process; the Faculty of Law’s Dr Mimi Zou presented on differing regulatory regimes between the UK and China in newly emerging areas of law; and Oxford Vice-Chancellor Professor Chas Bountra and Oxford University Innovation CEO Matt Perkins surveyed the role of higher-education in developing new technologies and nurturing entrepreneurial talent. GBCC and the ACYF look forward to continuing our cooperation to increase understanding, develop dialogue and foster professional relationships between emerging leaders of both countries.